Lakeland, Florida — A 25-year-old Central Florida woman is behind bars following the murder of her 6-year-old daughter and 50-year-old father. The Polk County Sheriff’s Office released a detailed report of the incident on Monday morning. On August 1, 2015, Polk County Sheriff’s deputies responded to 5221 Drane Field Road, Lakeland, in reference to a missing persons call. Upon arrival, deputies met with Cheyanne Jessie. She told deputies that she had dropped off her daughter, Meredith Leeann Jessie, at the aforementioned location to stay with her father, Mark Ivan Weekly, on July 18. Cheyanne stated that her boyfriend, Matthew Munroe, received text messages from Mark on July 19, which stated that Mark was leaving Florida with 6-year-old Meredith. The messages also indicated that Mark’s belongings should be sold or disposed of. When questioned about the text messages, Matthew told deputies that he and Cheyanne had previously argued about Meredith’s behavioral problems. He said that he told Cheyanne that if she didn’t get control of Meredith, he would leave her. Matthew also told deputies that when he and Cheyanne were shopping, she had asked him if he believed a human body would fit into a plastic tote. Additionally, she asked how long maggots take to consume a human body. Cheyanne stated that since the text messages, she had been returning to her father’s house to remove property. 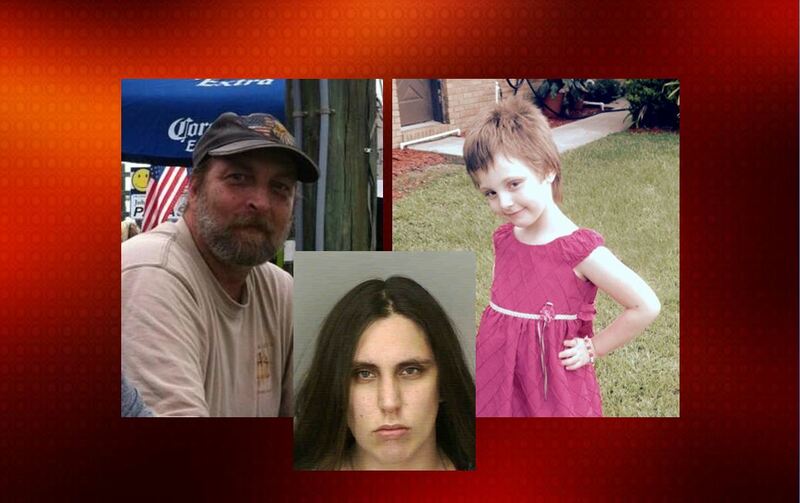 A friend of Mark, Vicki Parker, told deputies that on July 18 Mark had told her he planned to visit Georgia and was waiting for Cheyanne to provide an address for Meredith’s paternal grandparents. Vicki said that she became suspicious when she returned to the residence on July 22 and witnessed Cheyanne removing property from inside the residence. During the investigation, Cheyanne signed a consent to search waiver for her father’s residence. Upon entering the residence, deputies saw a sofa and love seat that had been covered with fresh white sheets. When the sheets were removed, investigators found large stains that tested positive for blood. Investigators also noted that the couch had been slashed multiple times. According to reports, the residence was overtaken by the smell of decomposing flesh and there were a large number of dead flies throughout the residence. Investigators then questioned Cheyanne about their findings. At first, she told deputies she returned to the house on July 18 and got into an argument with her father. She said he insinuated that she was a bad mother. Cheyanne said that Mark attacked her and that during the attack a knife fell from her pocket. She said that Mark pushed her on the floor, straddled her, and punched her in the head. She said that he then reached for the knife and attempted to stab her. Cheyanne claimed that during the struggle, her daughter ran to her defense and was stabbed in the throat by Mark. She said that after the girl was stabbed, she fell onto the sofa. She said it was at that time that Mark attempted to stab her again; however, she was able to punch him in the throat, take the knife from him, and stab him in the chest. She said she was then able to throw Mark off of her, at which time he landed on the love seat. Cheyanne stated that after she threw him on the love seat, he reached for a semi-automatic handgun that she kept under the sofa. She said that as her father raised his arm to fire the weapon, she pushed his hand upward and toward his head. She said the gun then discharged and a bullet struck him in the head. She told investigators that she then grabbed the weapon and fired it several more times. Cheyanne then changed her blood soaked clothes, grabbed the gun, and left the residence. Then, on July 20 through July 22, Cheyanne returned to the residence so she could clean up. Investigators reported that Cheyanne purchased air freshener from Walmart to cover the smell of the decomposing bodies and “bug bombs” from Lowes to kill the flies. Cheyanne used a shovel to scrape bodily fluids and human decomposition matter from the living room floor. Investigators said the house was wood framed and had a crawl space under it. They said that the floors were so saturated with blood, that it had soaked into the wood floor and was dripping under the house. During the cleaning process, Cheyanne stated that she took the bodies of her father and daughter and placed them into plastic totes. She then loaded the totes into her father’s Suburban. It was later determined that the totes that Vicki had witnessed Cheyanne removing from the home contained human remains. Cheyenne stated that after she loaded the bodies into the SUV, she drove to another residence located approximately 300 yards from Mark’s residence where she stored the totes in a shed, which was not climate controlled. Investigators located the shed and removed the totes. They confirmed that the totes did contain the human remains of her father and daughter. According to the arrest affidavit, investigators determined that after Cheyanne dropped off her daughter on July 18, she returned to her father’s house armed with a handgun and a knife. She then entered the residence and murdered her father and 6-year-old daughter. Cheyanne then attempted to conceal the crime by sending fake text messages from Mark’s phone. Additionally, she cleaned the murder scene and attempted to dispose of the bodies. Jessie was charged with two counts of First Degree Murder and one count of Tampering with Evidence. She is being held without bond at the Polk County Jail. PCSO Public Information Officer Donna C. Wood said that an autopsy will be conducted in order to determine the number of gunshots and/or stab wounds each individual sustained.